It’s fair to say that Gamesys offer a good selection of unique bingo and slot games. 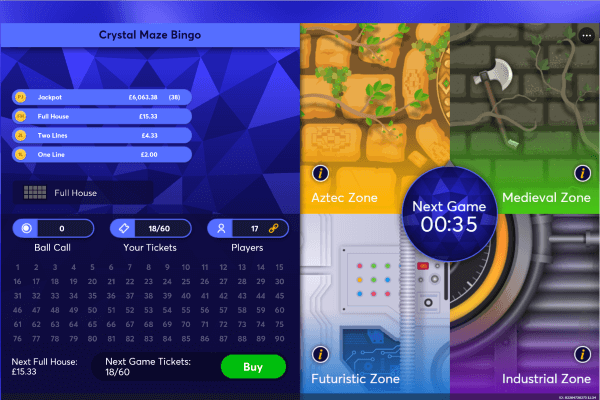 In October 2018 they launched a new variant of 90 ball bingo called Crystal Maze Bingo. This game is unusual in that it has changing backgrounds and themes, including the music. The name will be familiar from the TV gameshow of the same name and the similarity continues with the differently themed games and the fun bonus round at the end to earn free bingo tickets to the next game. Being 90 ball bingo this is a three line, 15 numbers to the full house game. You win prizes for being the first to complete all the numbers on one line, two lines or the full house. The prize varies with the price of the ticket, how many players in the game and how many tickets have been bought into the game in total. This game does not end with the full house. If you have purchased 6 or more tickets in the game you get to proceed to the Crystal Dome Bonus game. Here you opt-in to play the bonus and then gold and silver tickets start to swirl around the screen. You have to top or click the tickets – aiming for gold and to avoid the silver. At the end of the game the silver tickets you clicked are taken away from the gold tickets clicked to give you your total. You have a personal total for the bonus round and a community total and both have the chance of earning you extra tickets in the next game. 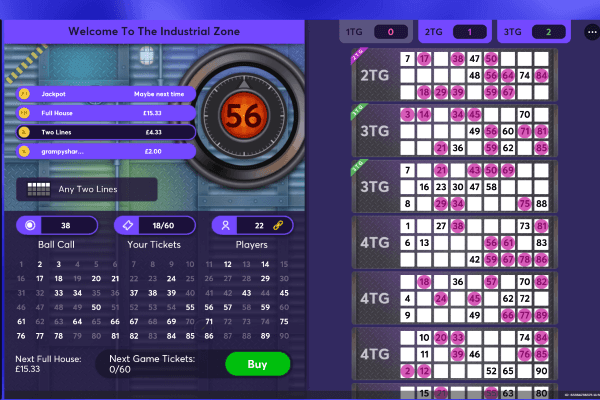 There is a progressive jackpot feature on the game that is set at 38 numbers. If you call a full house in 38 numbers or less you will win the progressive jackpot in this room. A lot of effort has clearly gone into the development of this new bingo game. The different themes have clearly different colour schemes and designs and even different background music. The caller does stay the same, however, no matter which zone you are playing. The bonus round is quite difficult. You have to click a certain point of the tokens to be sure of securing it for your balance and they move quite quickly. Practice clearly required! A nice twist on the standard 90 ball bingo game by Gamesys. It is good on desktop and laptop, but it does seem even better on a mobile ‘phone. The more compact nature of the mobile device seems to suit the layout of the game and especially the bonus round really well.